Fender transformed the Blues Deluxe amp into the Hot Rod Deluxe in the mid-1990s and gave it modified circuitry, a third "More Drive" channel, and a black/silver cosmetic treatment. Though the Hot Rod series amps are more popular than ever today, increasing numbers of guitar players continue to request the warm tone, unique circuitry, features, and look of the original Blues Deluxe version. The Reissue Blues Deluxe marks a return to that amplifier's tone and appeal. The Fender Blues Deluxe reissue offers two channels that are perfect for classic blues, country, and rock styles. The vintage channel serves up a great blend of cleans plus a bright switch for lead playing. The Blues Deluxe's drive channel pushes the 12AX7 preamp tubes harder and offers just the right amount of distortion. Independent gain and master controls in the drive channel give you lots of tone and level options. Fender does reissues right, and the Blues Deluxe is proof! Its cloth tweed covering will take you back, as will the vintage-style chicken head knobs and classic-looking chrome control panel. 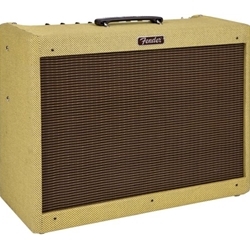 The Fender Blues Deluxe is an amp you'll love to own, love to play, and love to show off!